We meet Miguel as the delightful young boy in “Coco". He is born into a family of shoemakers where music is banned but he has a problem. He loves music. He knows he is a musician. He has built his own guitar resembling the guitar his idol used. That’s how we meet the most famous musician, Ernesto de la Cruz, beloved and adored. Miguel soaks in every word Ernesto says in videos of concerts, and in movies he acted in. Ernesto represents the story of a man who set out to follow his dreams and never turns back, whose tenacious commitment to his success meant doing whatever it took to “seize the moment.” “The rest of the world may follow the rules but I must follow my heart.” That is where the unease set in. Ambition that sees no limit — “is that a good thing?” I wondered. Miguel lives with his Abuelita who is Mama Coco’s daughter (and Mama Imelda's granddaughter) in a multigenerational home. And my heart twitches with loneliness. Miguel’s parents, cousins, uncles and aunts, grandmother, and great grandmother all live together. I never lived with my grandparents. I left my American Grandma behind when I was 4 and didn't see her again until I was almost 21. My father’s mother died in Sierra Leone when I was 7 or 8 as I grew up in Nigeria. My father’s dad and my mother’s mom lived in Sierra Leone and we treasured the times we spent with them when we visited. My mother’s dad died when she was a young child - I never met him. My paternal grandfather’s sister, Mama Jofuie was revered. Her name was also Ramata and her name lives on in many a grandchild and grandniece. The years that we had with these grands, they were beautiful. Every child should know the pampering and legacy of the generation before their parents. In Coco we see the immense love that Miguel has for his great-grandmother, Mama Coco. In “Coco” we see a culture where families live and work together. The families are artisans, craftsmen, farmers and they work and live together. The family business is the way a craft is passed from generation to generation and helps sustain the family. Tools, materials, and expertise are passed down in the way we go to school these days to attain formal education. I cannot help but imagine the love, joy and pride that also is passed down from generation to generation, or the lessons learned working alongside those you love and live with. The impact on a family that survives by trading and working together when one does not accept the baton can be profound. So what does it mean to be a boy with a love and passion for something outside the family’s business? Miguel lives a life like many people across the globe. While those of us who grew up in nuclear families may not realize it, much of the world lives in extended families. Children in such cultures grow up with their cousins, their grandparents in the same household or compound. Being surrounded by grandparents and extended family is perhaps one of the best images of trees connected by roots underground. These homes are not always harmonious but that is true of many nuclear families, too. The tales of wicked step-mothers and manipulative mother-in-laws are not pure fiction. But with Miguel’s family, it is different. My father’s family trade is education. At least that is how I see it. I joke that they are all teachers and preachers. My father and his siblings all have a track record in education — teachers at some level except my uncle who is a vet. My grandfather believed in education very strongly and invested in at least one child in every family of his siblings to help ensure a path out and up for the extended family. His contribution to his family and upward mobility was education. Grandpa Carew was a principal, sent all over the country to open and develop schools. He did this extremely well. I recall the day it occurred to me that I never considered not going to college. The culture in my home and the expectations regarding education didn't leave room to think of anything else. But what if I didn’t want to go to college and pursue an advanced degree? I fell in love with Miguel’s Abuelita. How could you not? She was fierce and strong and firm. The filmmakers tell us that Mexican culture is matriarchal. Matriarchs run the house, the finances, set the rules. Growing up in Nigeria, we saw stray dogs a lot and they were bothersome. So I cackled when Abuelita threw her sandal at Dante the stray dog and said, “You never name a street dog. They will follow you forever. Now go get my shoe.” Dante continued to follow Miguel, though, as a dog who loves its owner. 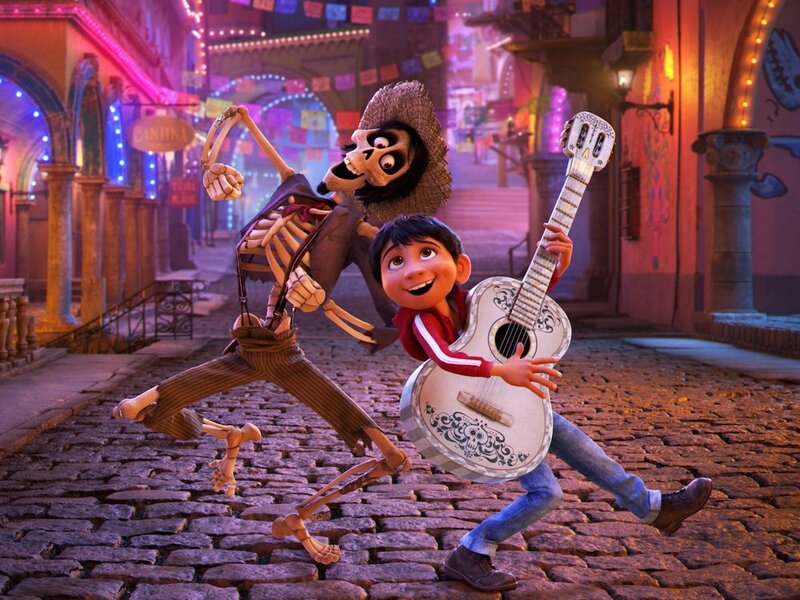 This tension between commitment to family versus doing anything it takes to succeed is central in “Coco.” The two are set in opposition. While this is often the case in our dialogue it raises the question of whether life really must be lived with those two commitments in opposition. The Riveras have banned music. No singing, no playing instruments, and Miguel can’t even be in the plaza with the mariachis. If we thought Abuelita was fierce she was a milder version of Mama Imelda, Mama Coco’s mother, who was abandoned by her husband as he pursued his dream of being the most known musician in the world. Mama Imelda’s husband leaves her behind with Coco as he pursues his music. And she raises Coco by herself, turning to shoemaking as the family trade that sustained the family. Mama Imelda represents family and tradition, fierceness and strength, and the sinewy ties of connection. After all, even though Mama Imelda was no longer living it was her ban of music that continued to be fiercely applied — with no questions asked. Miguel finds himself running away from his family and in the land of the dead. There he comes face to face with Mama Imelda who insists on the music ban as a condition of helping Miguel return to the living. Miguel runs off to find another relative who can bless him and send him back to the living. His mind is set on finding Ernesto who he believes is his great-great grandfather who was cut off from the family memory. In his quest, he meets Humberto. Humberto doesn't look too great. Unlike many of the other characters in the movie he appears homeless, his clothes don't match. He doesn't live with his family like other characters but rather in an area of town that includes other family-less dead. He is lost. Miguel needs Humberto’s help, and Humberto has just one wish — to return on the day of the dead before his daughter no longer remembers him, so the two make a pact. Eventually the two fall apart and Miguel runs off to find Ernesto on his own. The moment between Ernesto and Miguel and their re-union is tender and you can’t help but ache for a little boy who has finally found someone in his family who can relate to his love and passion for music. Ernesto is proud of his great-great-grandchild. In the conversation between Miguel and Ernesto, after Miguel had found his great-grand father, Miguel asks if Ernesto ever regrets leaving his family behind. Ernesto responds with, “Success doesn’t come for free Miguel. You have to do whatever it takes to seize your moment.” Ernesto still doesn't land right for me. And then the truth comes out. Ernesto is not Miguel’s grandfather. He is not a good person. Bad bad bad grampy. I am sorry. That was me shaming him. Ernesto consistently made bad choices. There- I fixed it. The pieces come together. I knew I was right about Ernesto all along. Isn’t it often true in our lives that the thing we seek, the fulfillment of our dream, is right in front of us and we don't see it as we chase something else that is shinier, brighter, and more beautiful on the outside? Through it all the street dog, Dante, that is annoying and looks funny turns out to be a good guide and friend to Miguel. What’s up with the love Miguel has for a street dog that’s ugly and missing teeth? And Dante loves him back. Dante, it turns out, also knows that Ernesto is really a bad guy. Dante is delighted every time Humberto and Miguel are together and also works to bring them together multiple times. Apparently, in the Aztec culture the dog escorted people on the path between the living and dead. Dante was a good choice in this movie. In the end we hear from Mama Coco. Throughout the movie we only occasionally hear her ask, “papa?” It disappoints Miguel when he tries to converse with her but she can’t because she is losing her memory. Cared for she sits in her wheelchair. How did it feel for Mama Coco to not mention her love for her father or that she missed him all the years of her life? Miguel the boy who set out to break free returns to the heart of his home and brings Mama Coco something no one else could have given her but for his rebellion — a memory for Mama Coco of her father, Humberto. What makes this movie magnificent is not just the tremendous attention to detail but also the amount of care and attention paid to the culture. We suffer from a lack of diverse representation in movies. But sloppy and inaccurate representation is disrespectful. The creators, writers, cartoonists, etc, spent a lot of time in Mexico with families, eating in homes and learning the culture. With color and precision they brought so much to life, from the movement of the skirts to the reflections of the candles. Now I want to experience Dia de los Muertos. The power, imagery and love conveyed into a festival that not only focuses on remembering our loved ones but honoring them and inviting them to celebrate with us is an homage to the ancestors, heritage and roots that captured my heart. That’s how intrigued this former pentecostal is because of how beautifully this movie centered that celebration. Have I ruined the movie for you yet? No? Then go see it. If you have seen it, please share in the comments what resonated with you.